All posts tagged with "sheer Taylorism"
The work shift system started out life not even really being considered a “system” per se but rather just a basic set of controls for when people would work. Characters would work during the day and sleep at night. 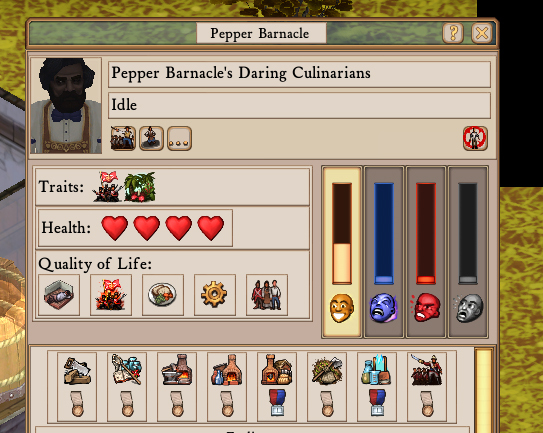 Pepper Barnacle, skilled at cookery as well as science; leader of the aptly named Daring Culinarians. His eponymous dish is feared, loathed, and loved in equal measure. Then we thought of a great way to increase game system interconnectedness by attaching the shift system to character happiness: The happier a character is, the more they’ll work. At this point, though, we also thought it would be a great idea since we’re now giving the shifts first class UI status by actually setting aside UI space to show the work shifts to allow the player to control them. Turns out this was not a great idea.